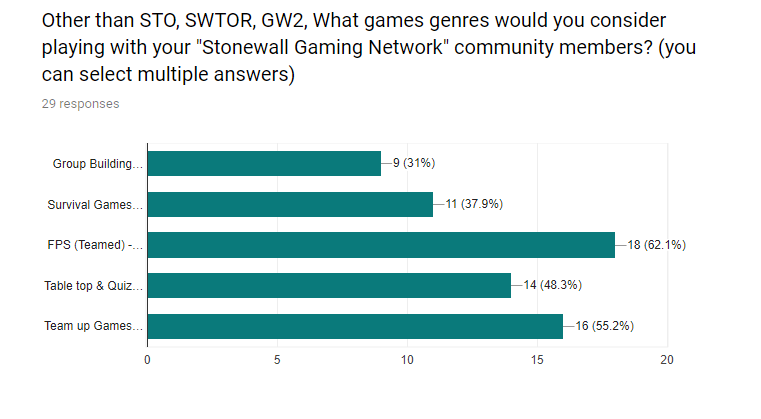 Since the success of the Overwatch Team up weekend a few months back and Volerons Poker nights, also from observing the chatter in our SGN discord rooms about various games people would like to try.. we thought it a good idea to get an idea of what Games you would like to team up in, alongside fellow Stonewall members. By teaming in these various games we hope to get some SGN members that maybe shy away from teaming, or people who find it hard to join public teams in their favourite games outside of SGN/STO/GW2/SWTOR. We could play With friends, in the safe environment of SGN. To get a good idea of what games you maybe interested in.. and what time you normally relax to play a game we've put together a very short survey and we would be interested to see the results. 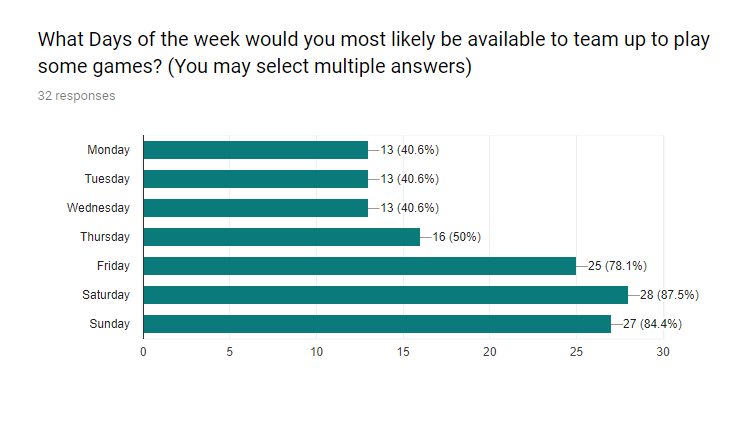 After we take a look at the results we could see what type of games people want to play.. or look at what appears to be popular in this forum post and we could maybe set up a day/weekend to play a certain or various games together. Obviously we have a few barriers.. such as we are all dotted around the globe so finding the right time when everyone could jump in. Please feel free to suggest any games you would love to play with your fellow SGN members on this post. I had a another very.. cheesy idea, about minecraft. Ive never played it.. and I dont understand the various Editions. But these people got together and made a massive building project.. to recreate the Enterprise D. after time others got involved to to help build this ship.. and its still on going.. ill link a video tube at the bottom. Id love it if we got together to do something similar.. build a project.. even if its a the SGN mansion/head quarters. I think it will be fun just to pop in there in your spare time.. jump in chat and start building things. G2A!!! Really that cheap... I have that app on my phone but I wasn’t sure if it was worth it or not. 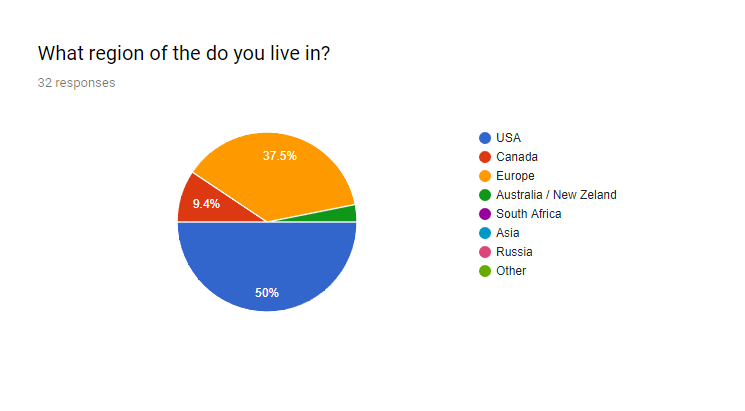 Thanks to everyone that took time out to fill in this little survey. this gives us as a fleet quite a lot to go with, not just for game up night events... but for future Stonewall Large events. 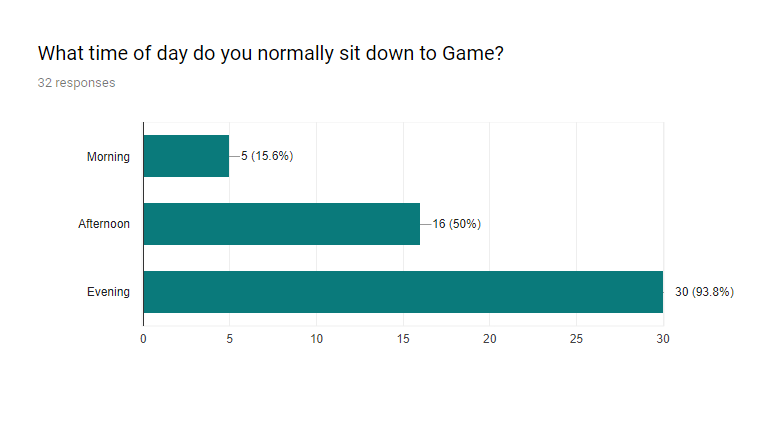 Here are some of the feedback graphs that everyone contributed too..
First Person Shooters came out on top, it looks like most of our members are interested in games like Call of duity, Destiny, Halo etc.. Weekends are a clear winner here, though Thurs night seems a possibility to. Thanks again for this information, this will give us some idea not only on the games we would most like to play as a team... but also peoples availability. being that we are a community that spans the globe, finding the perfect time for everyone to join in on an event is the most challenging. Using our SGN discord.. dont be afraid to create game nights of your own, to ask out if anyone wishes to join you in a certain game. We are all here for one reason.. to have fun in a comfortable environment with others who share similar interests and lifestyles, to team up with fellow members, to encourage the more recluse of member to jump in and enjoy, make memories. Stay tuned for various game night call outs soon! So ladies night is a go? Woot, let me get all the girlfriends together. We going to hit the town and get those free drinks like all the other bishes do. Get your best strut on ladies. Better be wearing those scants. Lol! P.s. I would not discount the table top games idea too quickly either. Seems like a nice thing to break up the monotony now and then once things become routine. Roughly 44% is still a good number. I also really like the pie charts and breakdowns. Great work!